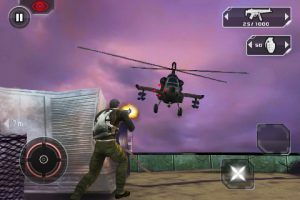 The 5th game in the Splinter Cell series, Splinter Cell: Conviction is the first of Tom Clancy’s titles to make to it on to the iPhone. 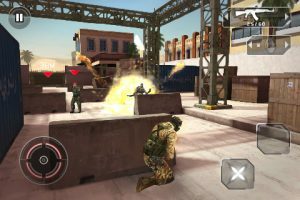 Originally released by Ubisoft for the XBox 360, the game has been completely redeveloped by Gameloft with the mobile gamer in mind. As in previous Splinter Cell games, Splinter Cell: Conviction puts you in the shoes of Sam Fisher, an elite operative from a black-ops branch of the NSA. The story starts out as a tale of revenge, with Fisher coming across some intel that points towards the identity of his daughter’s murderer. While this premise gets the plot moving, the story quickly diverges and turns into a race-against-time to prevent an attack on a major US city. As is traditional with the Splinter Cell games, Conviction is played out almost entirely in 3rd person. Conviction still retains elements of the stealthy man-of-the-shadows gameplay characteristic of previous titles, but also throws in a healthy mix of straight-up action. While this move may disappoint some fans of the series, a more no-holds barred approach works well on the iPhone, which is all about enjoying 5 minutes of pick-up-and-play than a two hour console or PC gaming session. The controls in Splinter Cell: Conviction are reasonably intuitive and shouldn’t cause too much confusion for anyone who has played a game of this type before. 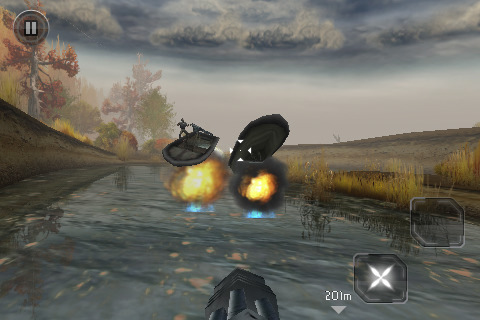 There’s a virtual analogue joystick on the left of the screen and two situation-dependent action buttons on the right. These buttons allow you to perform different actions like taking cover, crouching, grappling, shooting and even using an enemy as a human shield, all in one tap. One special move which has thankfully been carried over from the XBox version of the game is “mark and execute”. To pull this off you first need to take down an enemy using hand-to-hand combat or taking them as a human shield. After this, as long as you’re in a position where you can’t be seen (and within range), little circles will appear above the heads of any nearby enemies. To carry out the mark and execute move all you need to do is hit the attack button. You’ll quickly pop out of cover and take down the “marked” bad guys with clinical precision, and there’s nothing they can do to stop it. Navigation throughout the game is made very simple by means of on-screen waypoints which indicate your distance to the next objective. The waypoints are never too far apart so it’s pretty well impossible to get yourself lost. Most points give you further information on the mission at hand, while others will issue new instructions or objectives to complete. Splinter Cell: Conviction features 11 missions in total, spread across 8 different areas. While there is more emphasis on action in Conviction, stealth still plays a big role. Whenever you leave the cover of the shadows your enemies will be able to “see” you and the white visibility icon in the top left of the screen will turn red. To get out of sight you need to find some cover (useable cover is indicated by a white arrow) or get back into the shadows. After playing the game for awhile I found that it’s sometimes a little too easy to slip away. You can fire off a few shots right in front of an enemy and as long as there’s some darkness within a few meters, you can effectively “disappear” and he’ll walk around with no idea what happened to you. 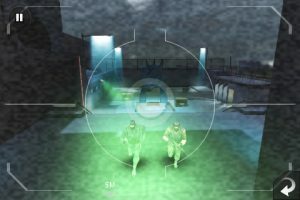 While not entirely realistic, this quirk of the game can be exploited though using the feature known as “last known position”, which leaves a white silhouette of Fisher at the point where the enemy lost sight of you, allowing you to slide to cover within range and then launch a new stealth attack. Splinter Cell: Conviction features some of the best 3D graphics I’ve yet seen in an iPhone game. I only ran into a few minor issues, which included choppy frame rates in some cut scenes and a reasonably short draw distance. A lot of quality voice acting has come straight from the XBox version of the game and even a few video intros have been included, which probably partly account for Conviction weighing in at a hefty 470mb.